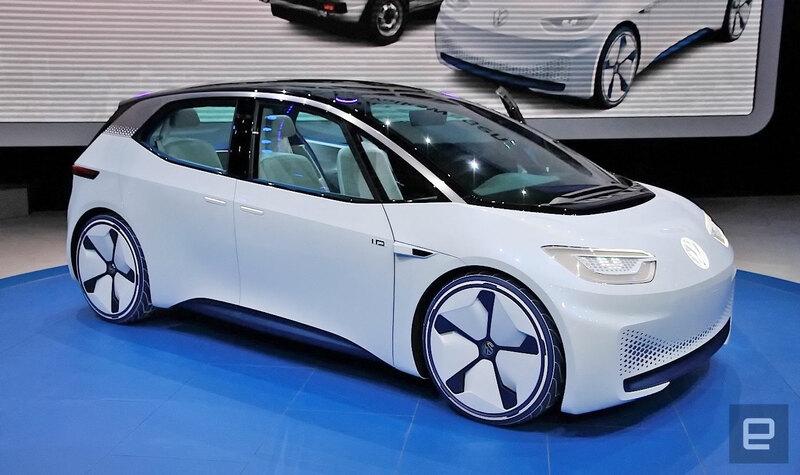 VW has kicked off the Paris Motor Show with some (much needed) flair, unveiling the fully electric I.D.. The I.D. looks like something straight out of Back To The Future II, and has a suitably futuristic release date too: 2020. Volkswagen claims the 125 kW motor in the I.D. will have a huge range, landing somewhere between 250 and a pretty impressive (if true) 370 miles. You might have to wait a few years to get one, and be prepared to pay "Golf" money for it, but VW says the I.D. is actually the "ambassador" for a whole new electric line-up. For now, we took a look at the concept model right here in 2016 in Paris. One thing's for sure about the I.D., VW's unlikely to get into another pickle regarding omissions (it has none). When it finally launches, the I.D. will be the first electric vehicle from VW with the company's new "Modular Electric Drive Kit" E.V. platform -- which is distinct from its current combustion, and hybrid models. We'd heard rumours that VW was planning an all electric with a pretty decent range back in August, and it looks like Volkswagen is willing to up its own ante, boosting the projected top end range to an estimated 370 miles (600Km). There are also plans to include automated driving (called I.D. Pilot), but that's not going to be ready until 2025, so you'll have a few years behind the wheel yet. We're a little early to put a price on it, but VW says it'll cost about the same as a Golf, despite it being smaller (yet with "the generous space of a Passat"). For us, it's all about those sweet wheels though.